Bill (Hancock) came from an illustrious family, being a third generation descendant of Phineas Banning, the founder of the Port of Los Angeles. Bill served in the US Navy during WWII, where he flew F6F Hellcats in the South Pacific. Just after Bill returned back to the States, he met Judy at a Christmas party in 1945. It was love at first sight, and Bill and Judy were married for 65 years. They lived in South Pasadena until 1958, moved to Santa Monica, and eventually to Balboa in 2005. Bill passed away in 2014 and Judy passed in April 2016. 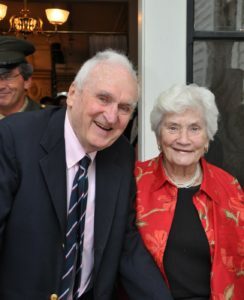 Bill and his wife Judy were lifelong supporters of education. Judy set up an endowment with the Pasadena Community Foundation in 2015, the Hancock and Julia Banning Endowment for K-12 Education to further support educational organizations long after they were gone.